ESO Supernova Exhibition — What causes day and night? Our home planet, the Earth, would be a cold and dark world were it not illuminated by the Sun. Owing to the Earth’s rotation around its axis, we experience day and night. Dusk and dawn: Because light is scattered in the Earth’s atmosphere, the terminator – the boundary between day and night – is not sharply defined. In a spin: Only one half of the Earth is being illuminated by the Sun at any one time. As our planet rotates around its axis, each place on the Earth experiences day and night. As the Earth orbits the Sun, it rotates on its axis, taking about 24 hours to complete one full rotation. At any one time, one half of the Earth is lit up by the Sun and experiences daytime, whilst the other half experiences nighttime. As the Earth turns, each place will move from day to night and back to day again. Since local time is governed by the Sun, every place on Earth has its own true solar time; but the time differences were not inconvenient until the arrival of long-distance communication and fast means of transport. That’s why the planet is now divided into 24 time zones. 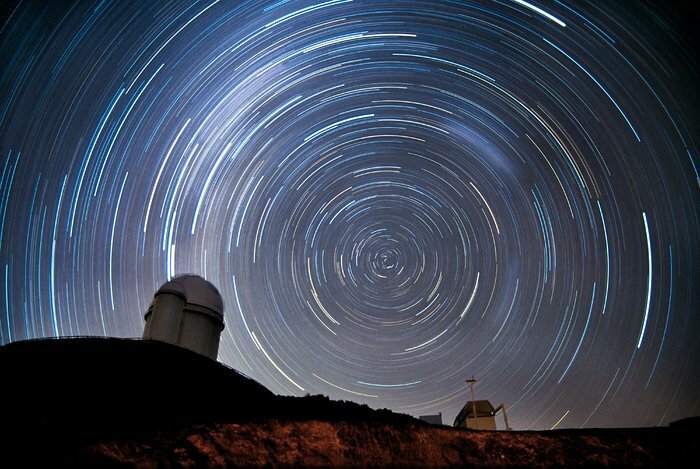 Star trails: In the course of two hours, the stars above ESO’s La Silla Observatory start to trace circles around the celestial pole because of the Earth’s rotation. Synchronising clocks: Without the benefit of standardised time zones, each place on Earth would have its own true solar time – a very impractical situation. The Earth spins like a top. When you’re on the side of the Earth that faces the Sun, it’s day. When Earth’s rotation carries you to the other side, facing away from the Sun, it’s night.